Foresthill is located about 20 minutes from I-80 and Auburn, down Foresthill Road, which crosses the world famous Foresthill Bridge. 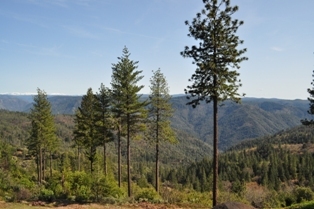 Foresthill is positioned along a ridge that is flanked by the North Fork of the American River on one side and the Middle Fork of the American River on the other. The eastern side of Foresthill opens into the Tahoe National Forest. Along with access to the two forks of the American River, Foresthill is also near numerous alpine lakes, the Foresthill OHV Park and the China Wall recreation area. Residents of Foresthill have access to camping, boating, fishing, hiking, mountain biking, off road trail riding, horseback riding, rafting, cross country skiing, snowmobiling and just about anything else an outdoor enthusiast could dream of. The Foresthill real estate market consists of homes on smaller lots in and around town, along with a wide selection of homes built on larger lots and acreage on the outskirts of town. There is everything in Foresthill from quaint cabins to beautiful custom homes in Monte Verde Estates and Todd Valley. There is also quite a bit of vacant land for sale in Foresthill as well, for those more inclined to building a home. Residents can find numerous small businesses and restaurants in town, along with a small country store for everyday shopping. For access to larger grocery stores and big box stores, many Foresthill residents take a short drive to Auburn.